Richard only came to Piping at the age of 27 and tried to do it himself. Here is a determined character when you consider his father was a regular soldier / Piper with the Black Watch but didn’t pass on his skills. Eventually, Richard moved on to take tuition in Dundee from Harry Ellis, but soon moved on to take up the challenge of the Practical Pipers. It was Richard’s father who took the remnants of the NCR Pipe Band and work hard at keeping them together. 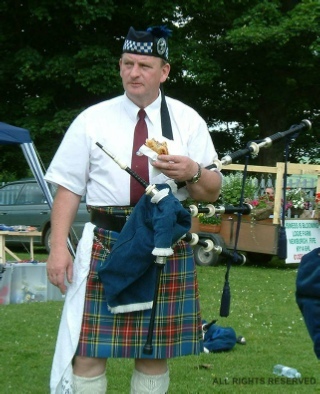 When Willie retired, Richard picked up the reins and has literally worked wonders in developing and running the Mains of Fintry Pipe Band. Who will ever forget the day he shook the world by marching his band into the arena for the opening ceremony of the Olympics in China. Richard remains probably the hardest working of any hobby piper.